The results of the 2015 JD Power India Sales Satisfaction Index (SSI) study are out. According to the study, Audi scores the highest in sales satisfaction when compared to other players in the luxury car segment. The study examines seven factors - delivery process, delivery timing, sales persons, sales initiation, dealer facility, paperwork and deal which contribute to the overall sales satisfaction. The satisfaction is calculated on a 1,000-point scale where Audi scored 888 points followed by BMW at 885 points and Mercedes-Benz at 878 points. The Sales Satisfaction Index was based on the response from 224 new-vehicle owners who have purchased their vehicles between September 2014 and April 2015. The overall satisfaction average is at 883 points, which is 7 points less than 2014. Contrary to the misconception that the luxury car buyers in India spend very little time and effort during the purchase process, the study says that they are quiet involved in the overall purchase of the cars. 35 per cent of the owners shop around for other models, 45 per cent of them use the Internet to search for key information about the cars and 80 per cent of them test drive the cars before making the purchase decisions. Mohit Arora, executive director, JD Power Singapore said, "Given the fact that the purchase of a luxury vehicle in India demonstrates the pinnacle of financial and social status, it would be prudent for dealerships to engage with shoppers in a constructive manner, such as proactive communications during the purchase process. Dealerships need to clearly identify and implement structured processes that allow shoppers to have an engaging buying experience." The SSI also finds that the average time to complete the sales transaction have increased to 10 days in 2015 compared to nine days in 2014 and the vehicle delivery time has increased to 12 days compared to 10 days in 2014. Communication on the committed delivery time, post sale feedback also improves the relationship with the customers and they expect initial service appointment to be set up on the completion of the purchase process. SINGAPORE: 15 October 2015 - Luxury-car buyers in India are highly engaged with the shopping process for a new vehicle, according to the J.D. Power 2015 India Sales Satisfaction Index (SSI) StudySM Luxury segment released today. Now in its 16th year, the study examines seven factors that contribute to new-vehicle owners' overall satisfaction with their sales experience (listed in order of importance): delivery process, delivery timing, salesperson, sales initiation, dealer facility, paperwork and deal. Satisfaction is calculated on a 1,000-point scale. Overall sales satisfaction in the luxury segment is 883 in 2015, a 7-point decline from 2014. The misconception is that luxury-vehicle buyers in India, who tend to be more affluent than mass marketvehicle buyers and often own multiple vehicles, spend very little time and effort during the purchase process. The study finds that the contrary is true: luxury-vehicle buyers in India are quite involved in the overall purchase experience. More than one-third (35%) of these buyers shop around for other models, with 45 percent of them using the Internet as one of their key information sources. Furthermore, luxuryvehicle buyers visit an average of three dealerships during the shopping process, with 80 percent of them test driving the vehicle they are considering before purchasing. "Given the fact that the purchase of a luxury vehicle in India demonstrates the pinnacle of financial and social status, it would be prudent for dealerships to engage with shoppers in a constructive manner, such as proactive communications during the purchase process," said Mohit Arora, executive director, J.D. Power Singapore. "Dealerships need to clearly identify and implement structured processes that allow shoppers to have an engaging buying experience." KEY FINDINGS ? The average time to complete the sales transaction has increased to 10 days in 2015 from nine days in 2014, and the time for vehicle delivery has increased to 12 days after booking in 2015 from 10 days in 2014. ? Communication on the committed delivery time is one of the activities that can improve the relationship with customers. Overall satisfaction among the 82 percent of customers who receive regular communications from their dealership during the purchase process is 887, which is 21 points higher than among those who do not receive regular communications. ? Post-sales feedback is another important area to engage with luxury vehicle buyers. Overall satisfaction among the 84 percent of luxury-vehicle owners who are asked for their feedback regarding the buying experience is 886, compared with 870 among those who are not asked for feedback. ? Luxury-vehicle buyers in India expect the initial service appointment to be set up on completion of the purchase process. Overall sales satisfaction among customers who are offered this service is 888, which is 27 points higher than among those who are not offered this service. Study Rankings Audi ranks highest in luxury vehicle sales satisfaction with a score of 888. Audi performs particularly well in the salesperson factor. BMW ranks second at 885. 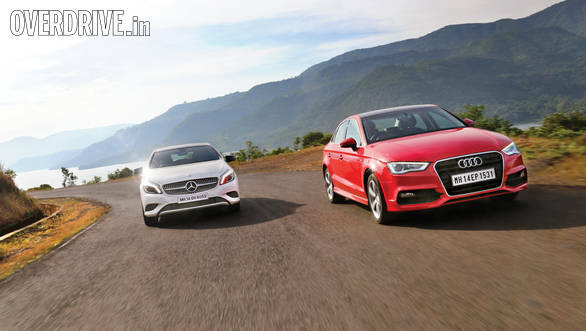 The 2015 India Sales Satisfaction Index Study for luxury brands is based on responses from 244 new vehicle owners who purchased their vehicle between September 2014 and April 2015. The study was fielded from March through July 2015. Study findings for the mass market segment were announced on August 31, 2015.